Today was my last day at Alvis House, and it feels so strange to be leaving. I spent forty hours a week for ten weeks in this office and got to know a lot of interesting, funny, intelligent, and genuinely caring people. Saying goodbye is always really hard; you’re stuck between, 1. Wanting to just hug everyone and tell them, again, how much you REALLY loved meeting them and getting to know them, honestly, and 2. Maintaining professionalism and avoiding over-doing it, to the point where it’s uncomfortable. Luckily, the people that I’ve worked with over the past ten weeks didn’t mind a bit of hugs and sappy goodbyes. 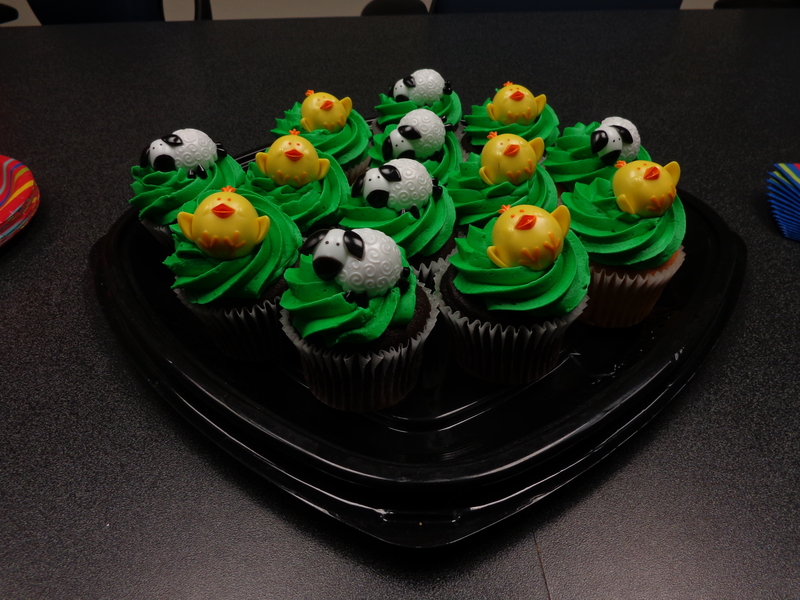 They even threw me a little going-away party in the conference room, complete with cupcakes appropriately topped with plastic lambs (a reference to both my last name and the agricultural venture I’m taking on next). 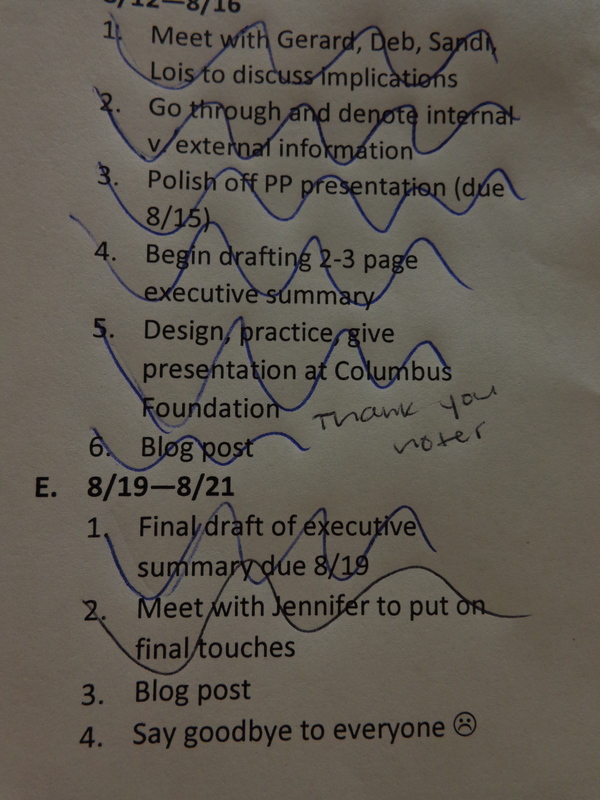 Here’s the panicked mid-fellowship to-do list that I typed at the start of Week 6. Everything on the list has been completed and crossed off (except the writing of this very blog post and a few more goodbyes that need to be said), and that is something that felt like a momentous task when the list was compiled. However, a little bit of focus, planning, and self-imposed deadlines go a long way. All of the research from the summer has been compiled into one giant 220-slide PowerPoint presentation and will be accessible to people throughout Alvis House. I was able to meet with some of the department heads to discuss the implications, and it felt good to know that the information gathered will be helpful when moving forward with programming, etc. Thank you Alvis House—especially my supervisor, Jennifer, as well as Gloria, April, Arlene, and Denise, the President and CEO—for the amazing experience! And thank you to the Columbus Foundation for the wonderful opportunity as well.